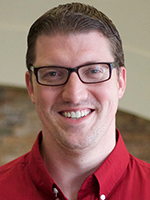 Jeremy Gengler has led student ministries for over twelve years. Prior to coming to FBC Midland, he served churches in Oklahoma, Tennessee, Florida, and Arlington, Texas. He is currently in the final stages of completing his Ph.D. in Student Ministry with a minor in Biblical Counseling from Southwestern Baptist Theological Seminary. Fifteen years and counting, Jeremy has been the extremely blessed husband of Jessica (he definitely married up!). He is also father to their four high-energy boys: Ethan, Sam, Simon, and Jude. Other than the Bible, Jeremy's favorite book is...well...it's hard to say. His Ph.D. studies require him to read 750-1000 pages every two weeks. However, the author that consistently has impacted him most is Oswald Chambers. Jeremy prefers a beach vacation to any other vacation, so long as he generously applies and reapplies sunscreen. His favorite vacation was with his wife in 2015, when they won a trip to Puerto Rico. Hearing the roar of the waves while laying in a hammock and listening to live, Caribbean style music while the ocean breeze courses through the trees--that's his vacation sweet spot. Jeremy loves to laugh and attempt new challenges. He also loves to spend time with his wife and kids. What Jeremy does not consider fun is roller skating. Ask Jeremy's wife to tell you how closely Jeremy clung to the wall when they went roller skating on their honeymoon. Incidentally, they have not gone roller skating since. For Jeremy, the most amazing thing about FBC Midland is the degree to which FBC Midland absolutely loves its students and sees the youth ministry as an integral component of the overall church ministry. Also, FBC Midland is the place where Jeremy was saved, baptized, and called to ministry. For Jeremy, serving at FBC Midland is like coming home. To those who are on a spiritual journey with Jesus, Jeremy offers the following advice: the Christian life is not about you living and performing up to Jesus' standard; the Christian life is about Jesus living his life in and through you. Cease striving; start abiding. As you abide in Jesus, Jesus will abide in you, and the Holy Spirit will produce fruit in your life that causes the world to sit up and take notice of who Jesus is. Galatians 2:20: "...it is no longer I who live, but Christ who lives in me..."